Magnolia Park Elementary has a new tool for homebound students with special health needs. They are now using the VGo robot to help students K-5 remotely attend school. Jade Marin is not letting her illness keep her from attending school and sharing laughs with her classmates. Last year Marin, a kindergartner, was diagnosed with leukemia. Thanks to a new robotic device called VGo, for about two months she has been able to participate in class while staying at home. 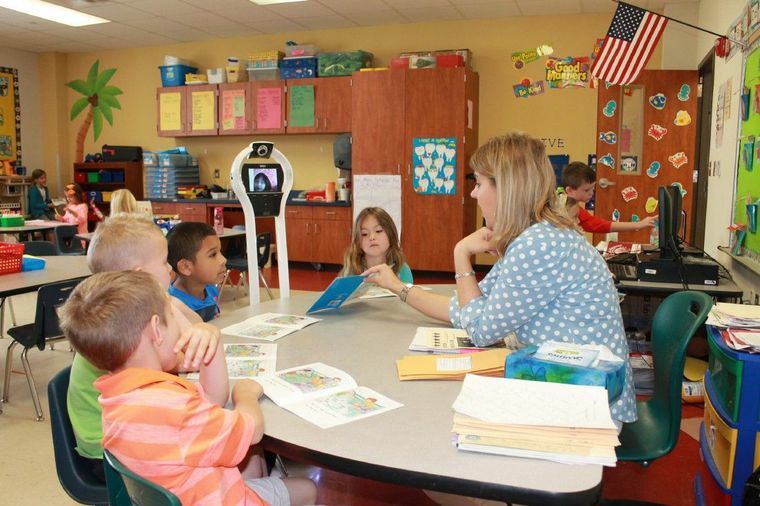 VGo is a 4-foot tall robot with a wireless video hookup allowing the student to remotely experience school. She answers questions by making the robot flash, instead of raising her hand and talks with the teacher. The device is not just stationery; it also is able to look down or up helping Marin see everything going on in the classroom. Because of the easy access, the young student can walk through the hallways and also hang out with her friends during recess. “I like it, I call it Jasmine,” she said. Her mother Yesenia said her daughter enjoys being able to still interact with the kids despite her diagnosis. The most important thing, she said, is her daughter is learning with the rest of the class. “This makes her happy, so I am happy,” she said. Stacey Smith, kindergarten teacher, said the robot not only is helping Marin be a part of the class but it also helps her classmates feel better about her being homebound. According to Smith, Marins’ classmates were a little scared after she was diagnosed with leukemia and began to worry about her. The device assures them she is alright. Communications Director, Denise Meyers added that VGo is a healthy way for students like Marin to interact with their classmates. She said soon another student at the school will attend class by using VGo. Melvin Garcia, a fourth-grader at MPE, has been diagnosed with dyskeratosis congenita. He currently attends school but is on oxygen and carries a tank with him at all times. He will soon start participating in the class through the robot. Technology Assistant, Laura Cruz, added how this is the first time MISD has used this equipment. According to Cruz, VGo being used in schools stems from Morgan’s Angels, a program allowing students to attend classes via interactive video conferencing while recovering from a long-term illness. Cruz said she knows Garcia wants to be at school, and this gives him the option to do so without risking his health.